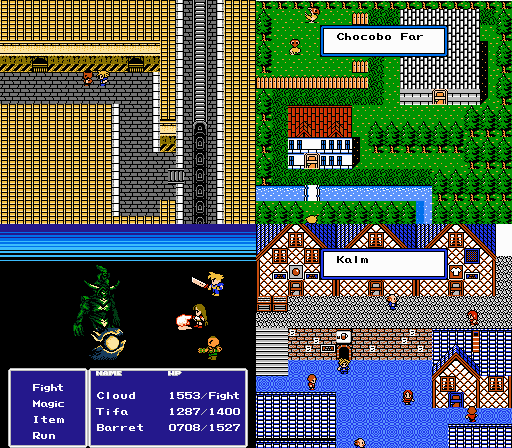 And yes, you've read the above correctly: Final Fantasy VII for the Nintendo Entertainment System. Well, to split hairs, it's Final Fantasy VII for the SUBOR Entertainment System. The game is a Chinese pirate of the 1997 PS1 version; probably cobbled together from Final Fantasys 1, 2 and 3 for the NES and released sometime in 2005. Since fluency in Mandarin isn't among my many skills, my review is based on an English translation/face-lift hack (still in progress) coded by a brilliant group of hackers at romhacking.net. And right from the start, this game makes clear it isn't effing around. Though most all the the graphics and music are unique to the English translation, the Chinese story and game mechanics follow as close to the PlayStation version as 8-Bits will allow. 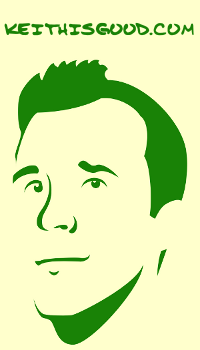 The game is inevitably shorter; with sidequests and flashbacks either truncated or cut entirely. This means no Yuffie (yay!) and no Vincent (boo!). Most of the game's final act gets the axe as well, with the final battle coming directly after the meteor is first summoned. I won't go through the game point-by-point--like I've said, it follows the PS1 version. What I will say is that the NES version of FFVII is an amazing accomplishment. Both from the original Chinese Game Pirates ("編曲!" [translation: "Arr! "]), and even moreso from the Hackers who've overhauled the graphics and translated the game to English--to bring a PS1 gaming experience to NES technology is a hurculean achievement. The above screen serves as perfect example. 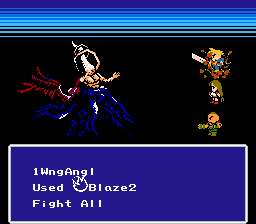 The final boss fight is at once both instantly recognizable from the PS1 version and undeniably in the mold of the NES Final Fantasy games. 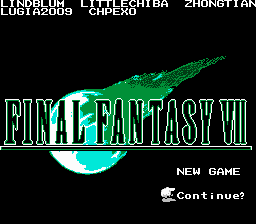 Even if divorced completely from it's prototype, Final Fantasy VII for the NES provides a full, satisfying gaming experience.